Three feathers needed a new logo design and created a contest on 99designs. My name is Shawn Tucker. (female BTW!) I love horses and photography! My family and I operate a rare horse breed farm and breeding operation. And, I own a photography business. The two are very much inter-linked and I need a logo to represent both. The names of the 2 businesses are "Three Feathers Creative Photography" and "Three Feathers Native Curly Horses". Target audience would be anyone interested in horses (for riding or admiring! ), art and/or photography of horses or humans! These horses are HYPO-ALLERGENIC for those with horse allergies! So, plans for this logo include making brochures to send to doctors specilaizing in allergies as well as use on my up and coming website, business cards, stationary, etc. I plan to use it with my signiture on the bottom of all my emails, and have it painted on the side of my truck! I am wanting to have it embroidered on shirts and jackets and anywhere else I can think of! Looking for a creative & unique image. No stock images please. Our horses are of Native American descent, are rare and special, so want to exhibit that quality as much as possible. I have some good ideas to go on, but am open to other ideas as well. 1- Some nice images of our horses for inspiration at http://www.pictage.com/648701 -click on album tab for a nice slide show and descriptions. 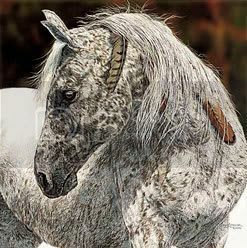 *mane of horse in image needs to be WAVY to represent the breed! Just need 3 feathers in their mane and possibly tails! 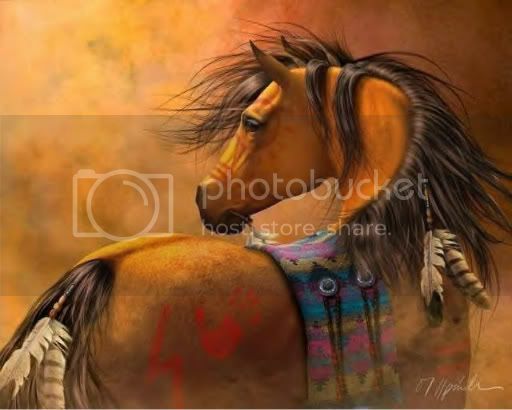 One thought I had was the horse image in silhoutte, with feathers outlined in foreground and possible sunset or Indian images in the background. Possibly a mare and foal as seen in image #8 of album mentioned above.